Brian has the misfortune to be born in a stable next to that in which Jesus is born and is accidentally approached by the wise men before they realise their mistake. He grows up, and together with other Jews is oppressed by the Romans, who have done nothing for them except the roads, education, the health service and more. He accidentally becomes a preacher who is pursued by a load of followers until taken into custody and together with many others is sentenced to be crucified. Essentially this film is a load of connected sketches, set at the time of the birth of Jesus. The People’s Front of Judea meet frequently in secret but never actually do anything, Brian engages in some grafiti writing to be corrected in his Roman grammer by a centurian, after he has made a speech Brian is pursued by a crowd of followers. 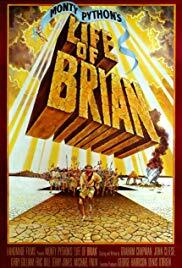 More famously Brian appears naked in front of his followers after sleeping with Judith, and the finale including “Always Look on the Bright Side of Life”. A View If you have not seen this , it is essential viewing, and even if you have seen it, it is worth a revisit, but maybe not if you are sensitive about the religious content, even though it is generally thought not to be blasphemous. It does deal with obsessive religious situations in an entertaining way. Who cares what Rotten Tomatoes thought, we think it is fantastic. A MUST SEE. Source of story Well, you decide. Additional Info The film was banned in many places both in the UK and abroad. The ban was only lifted in Aberystwyth in North Wales, in 2009, when Sue Jones-Davies, who had played Judith, was elected mayor.